From our discussions of Hue we learned the basic properties of what the human eye perceives as color. In later essays we looked at how some of these principals might be applied in practical theatrical settings. Until now we have left out one of the most fun parts of working with color. Color Mixing. Color Mixing is where we really get to test our knowledge of light and color and see what we know. We have already done some mixing through our exploration of Missing Color Syndrome but that has all been reactionary. We were trying to solve problems, not create environments. Now we will look at color and color mixing as a proactive tool in the designer’s tool kit. As we recall from our basic color wheel there are three Primary Colors of light; Red, Green, and Blue. Those can then be mixed into the three Secondary Colors of light; Magenta, Cyan, and Amber. Obviously by varying the amount of each color, or mixing in slight amounts of the third Primary you can get the full range of possible Hues out of these three colors. Needless to say, you need not limit yourself to six heavily saturated Hues. You can see from the image on the left the basic principals of Additive Color Mixing with light. It is called “additive” because we might take a Red light and ADD Green to it to make Yellow. For those new to mixing light and color this can take some time to wrap your head around but this is how the process works. Red+Green=Yellow. Green+Blue=Cyan. Blue+Red=Magenta. All but the first make logical sense to a brain trained to understand colors in terms of pigments. But we must unlearn that knowledge if we are to truly embrace the power of color. So Additive Color Mixing comes about when we have two or more Hues mixing together to create a third Hue. This has traditionally been the most common form of color mixing in live performance. However, with the advent of Automated Lighting we have seen a radical shift towards a second method for mixing colors. That is Subtractive Color Mixing. In order to fully understand subtractive color mixing we need to back up a moment and review. What the human eye perceives as White light is really just the phenomenon of the eye seeing a roughly even distribution of all the colors in the visible spectrum. With that in mind let us look at a typical lightbulb. When the light is on, it emits light across the full spectrum of visible light. If we put a Red (say G250) color filter in front of the light we are not “turning the light Red.” Rather, what we are doing is blocking off, or filtering out, every wavelength of light except those in the Red range. Now Subtractive Color Mixing gets a little complex, for those new to it please bear with me, the pay off is definitely worth it. When dealing with Subtractive Color Mixing we actually need to invert our understanding of Primary and Secondary Colors. 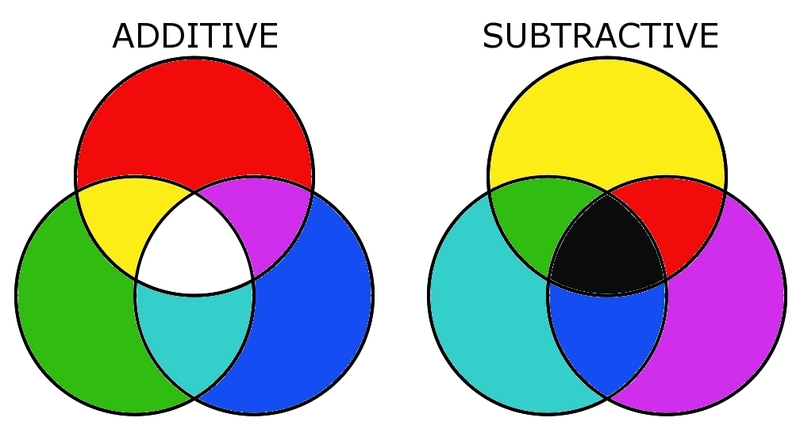 If Red, Green, and Blue are our Primary Colors for Additive Mixing, then Cyan, Yellow, and Magenta are our Primary Colors for Subtractive Mixing. That’s three different sets of Primary and Secondary Colors (when we include the Red, Blue, Yellow of pigments) we have to keep in our brain. Subtractive Color Mixing actually subtracts in two ways. First is the method described above where it subtracts all the wavelengths NOT in the color filter. So when we put a Magenta filter in front of a light we are removing all the wave lengths that are not Magenta. Now, remember that Magenta is comprised of Red and Blue. So when we put that filter up it is as though we were using a Red and Blue filter together. If we want to make Red we need to get rid of the Blue. 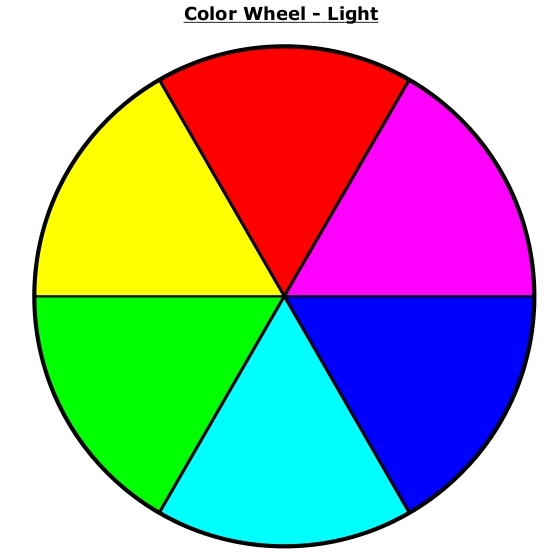 If we recall our Primary Color Wheel for light we remember that Blue and Yellow are opposite colors. By adding Yellow to the Magenta we are in essence canceling out the Blue and leaving us with Red. If an algebra equation would help, we are trying to solve M+Y=??? We know that Y=(-B) and M=(B+R) so the equation could be rewritten (B+R)+(-B) or B+R-B=R. Clearly we don’t need to go back to High School Algebra to understand color, but it can help to wrap your brain around the processes involved in Subtractive Color Mixing when first encountering these ideas. Many Automated Lighting systems utilize Subtractive Color Mixing in their color functions in order to give the designer a full range of colors to work with in their projects. I would like to explore two commonly used accessories. The first is the Wybron CXI and the second is the Morpheus Color Fader. Both of these devices use Subtractive Color Mixing (known in the industry and CMY Color Mixing). Wybron’s technology uses two strings, one with various saturations of Cyan and Magenta, the other with various saturations of Magenta and Yellow. Morpheus uses three strings of color. One each for Cyan, Magenta, and Yellow. The strings range in an even transition from Clear to full saturation. While the Wybron will give you 432 colors, the Morpheus will give you millions of color options and a degree of precision not available with the Wybron units. Further, because the Wybron units employ discrete pieces of gel strung together one cannot do live color fades without stepping through various unwanted and potentially unpleasant colors in the process. This is the same problem encountered when using a traditional color scroller. The Morpheus technology on the other hand allows for smooth color transitions live on stage. In addition, because it employs three color strings, the designer can vary the speeds at which the different colors crossfade. So if one wanted to fade from Red to Blue, you could have the Yellow fade out faster and the Cyan fade in slower thus passing through Magenta rather than some strange unwanted color. In a lighting world where advanced automated systems are becoming more and more prevalent, the designer must have an implicit knowledge of these technologies and the color theories underlying them. Even if your work does not typically use color changing technology of this sort, you will inevitably find yourself in situations where you will have to grapple with them. Forewarned is forearmed. Solving problems is a lot more interesting than sitting around trying to decode complex color theory. Especially when the clock is ticking ever closer to opening night. If we return to our Woman-in-a-red-dress we immediately see the benefits of these theories and their related technologies. Rather than spending tons of time sifting through gel books in the studio and comparing them to the fabric swatches, we might simply point a few of our moving lights, or color changing crosslights, at the Woman-in-a-red-dress on her entrance. From there we can fine tune the color to precisely match the tones of her costume and skin. Having this control is especially nice when the fabric gets dyed a slightly different Hue than we originally planned for. Perhaps the whole stage goes Red upon her entrance in a bump. Then the rest of the stage does a color fade to our recessive Blue while she walks out and takes control of the scene backlit in Red, with crosslights perfectly matched to her skin tone. Being able to have just the right mix of Yellow and Magenta to make the dress truly shine takes skill, patience, and attention to craft. Knowing the uses and distinctions between Additive and Subtractive Color Mixing is a powerful practical application of lighting Color Theory. In later posts I will be exploring Gray and The Effect of Lamp Type. I hope you found this useful. Please take any new ideas and start experimenting. We will continue to build on these concepts throughout this series. Stay tuned. Was this useful to you? Please let me know what you thought in comments. Or leave any questions you may have and I (or other commenters) would be happy to answer. I am a student studing Technical Theatre and this helps with one of the essays I have to write thanks. I am both a teacher and a student. As a high school journalism teacher who has worked with the newspaper and yearbook students for many years, I have developed a love for graphic design. Currently pursuing a Digital Design degree, I have had several courses dealing with color theory. I must always pause and rethink when I get to the “additive” and “subtractive” colors. This explanation is one of the simplest and best I’ve read! I will bookmark the link and refer my students and classmates to it. All I can say is…a big thank you for walking me through the process. I will certainly remember it! Yes, This is helping me to write a paper, but it is still, for me, clear as mud! lol But thank you so much for posting. Im a technical theatre student, and well to be truthfull… lighting isnt my ‘thing’, but having said that, im really trying to research and get my head around it. i found your article really intereasting, but would like to ask one question? … when you say ‘Hue’, what do you mean by this? is it a technical term for colour? if you could reply, this would be really helpful. If, after reading it, you still have questions I’d be happy to answer. If you combine Cyan, Magenta and Yellow light, don’t you get black? The more light you add the brighter something gets. So combining all three primaries gives you white. I don’t do the math part. Just the art. But I’d love to see what you find.